In search of a super filling, healthy, quick and easy to prepare dish perfect for any time of the year? 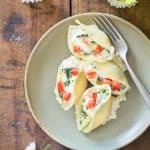 How about Spinach and Ricotta Stuffed Shells! A pasta recipe to print and save forever! Add zucchini and spinach to pan and cook for about 2 minutes, then remove from heat. Drain shells and immediately rinse with cold water to avoid from sticking together. Fill shells with filling by holding in one hand and filling with a spoon and then place on the ricotta sauce layer in the ovenproof dish. While shells are baking, deseed tomato and cut into small cubes. Decorate shells with cubes and serve immediately.